LMI Technologies (LMI), a leading developer of 3D scanning and inspection solutions, is pleased to announce the launch of the Gocator® 2512 laser line profile sensor, a dedicated high-performance 3D machine vision solution for scanning glass and other specular surfaces. The company introduced the new sensor at Vision Shanghai, March 20-22, 2019. Gocator® 2512 has the unique advantage of being able to scan specular and diffuse surfaces simultaneously. For example, the sensor can generate a precision 3D scan of a cell phone’s cover glass in a surrounding metal or plastic frame, inspecting critical assembly tolerances such as flushness, gap, and offset. The sensor leverages specialized laser projection technology that can handle a wider range of surface angles, material types, and surface colors. Competing laser profilers use a collimated laser beam that does not offer the same target angle performance. Gocator® 2512 also delivers high speed, reliability, and superior data quality in GD&T measurement of component assemblies with various challenging surface finishes (e.g., transparent, anti-glare, coated/uncoated, low/high contrast, UV, and glossy). “With the Gocator® 2512, we now offer our customers a dedicated 3D sensor model specifically for glass and specular materials, with all of Gocator’s smart capabilities including onboard data processing and built-in measurement tools. 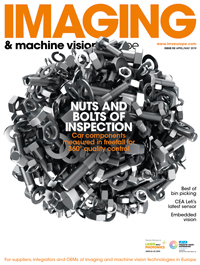 The sensor’s unique optical design delivers exceptional performance in challenging specular scanning applications, in a more cost-effective package than competing technologies such as confocal scanners,” said Chi Ho Ng, Senior Director of Applications, LMI Technologies.